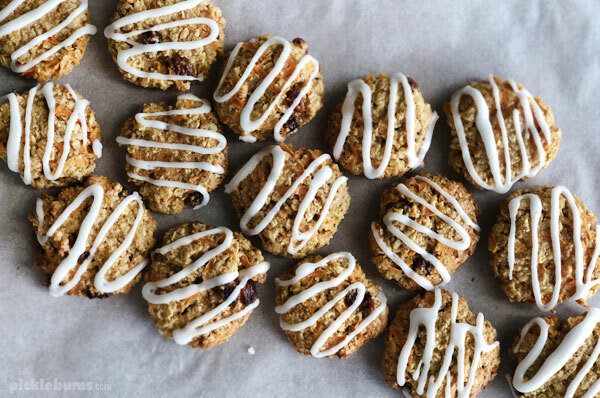 These carrot and oat cookies are probably not very healthy, but they are definitely delicious! I decided to make some cookies, some ‘healthy’ cookies. I decided to make some carrot and oat cookies. Then I discovered I was out of wholemeal flour, so I used regular white flour. But they still had carrots in them and oats, the cookies were still healthy right? Then I discovered I didn’t have enough honey, so I used brown sugar instead. Now the ‘healthy’ was definitely becoming a bit of a stretch. 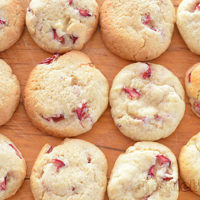 So then threw the ridiculous idea of a ‘healthy cookie’ out the window and I drizzled icing (frosting) all over those suckers! I’m sure ‘healthy cookies’ exist, and I’m sure they are delicious (if you like that kind of thing) but I’m done worrying about how healthy my cookies are, I just care how delicious they are! 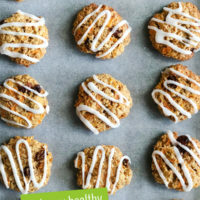 And these carrot and oat cookies are really delicious! 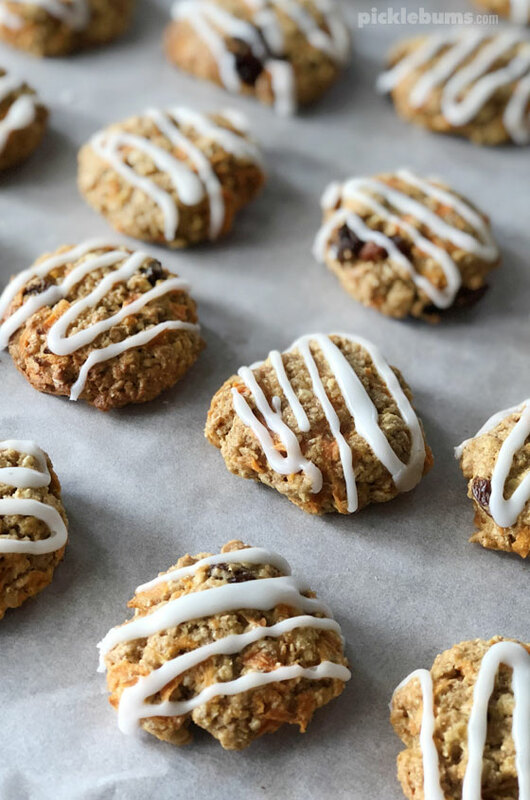 Oat cookies are good any old day, but add grated carrot for some sweetness and moisture, and chuck in some cinnamon and allspice, and you get a cookie that tastes like carrot cake! Awesome! 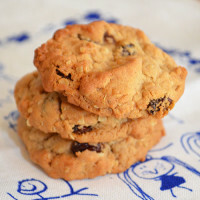 You can use plain flour, wholemeal (whole wheat) flour, or even oat flour to make these cookies, whatever you have is fine. You could also use 1/2 cup of honey if you wanted, but the 3/4 cup of brown sugar works great too. Feel free to substitute the coconut oil for butter but make sure you use quick cook oats in this recipe, not rolled oats. These would be great with a big dollop of cream cheese icing/frosting on the top, but of course I didn’t have any cream cheese! Instead I made up some basic icing with icing sugar (powdered sugar) and lemon juice, just runny enough to drizzle over the cookies. 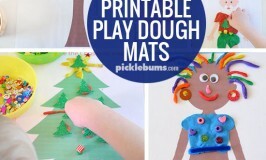 Preheat your oven to 180 C and line two baking trays with baking paper. 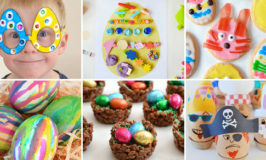 In a medium sized bowl combine the cooled, melted coconut oil, eggs, sugar and vanilla and whisk well. Add the baking soda, flour, oats, cinnamon and allspice and mix together. Add in the grated carrots and sultanas and mix them in gentle. With wet hands, roughly roll small spoonfuls of mixture into balls and place on the tray, flattening a little. Bake at 180 C for 15 minutes or until they start to brown at the edges, don't over cook! When completely cooled drizzle with a simple icing sugar and lemon juice mixture if desired. What do you think? 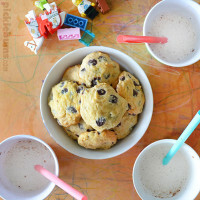 Healthy cookies? Yes or No? What makes a cookie healthy or unhealthy? 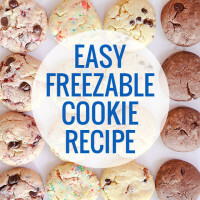 Do you have a delicious healthy cookie recipe I HAVE to try? 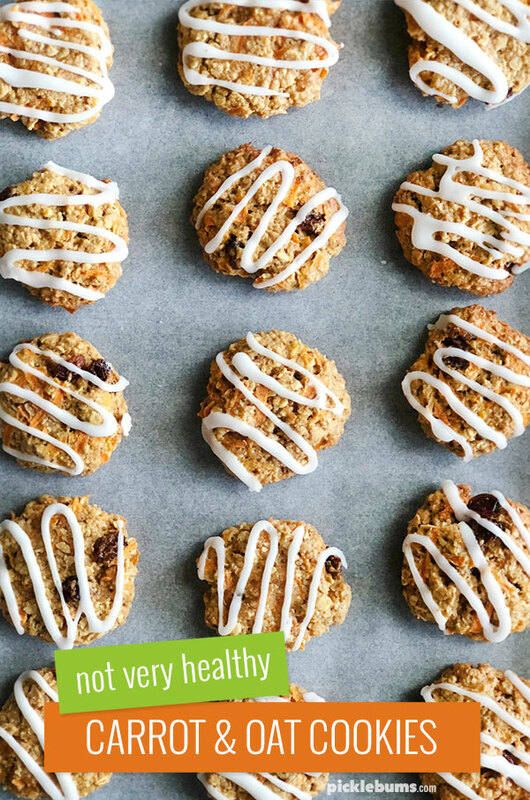 Leave me a comment below and let me know what you think about healthy cookies! 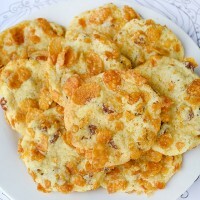 Looking for some other ‘not healthy’ cookie recipes? Try one of these! Super tasty. I tried using honey, but they ended up too moist to roll by hand (so I added more flour). How much honey would you have added? You usually use less honey than sugar… I’d go with about half a cup… or even a third. 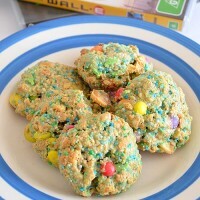 But they are a fairy moist cookie and not easy to roll into balls regardless.